NextMeet us in Grand Park on 10/19! 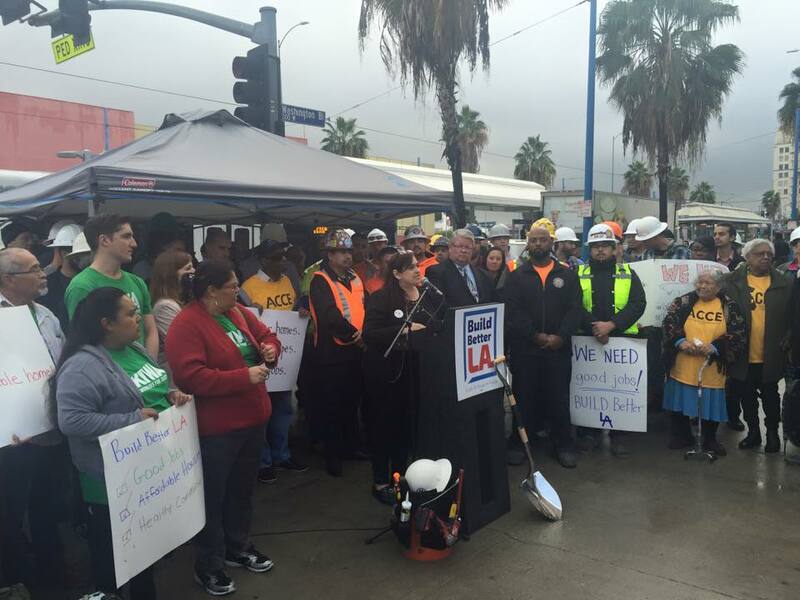 Today, ACT-LA joined the LA County Federation of Labor in the groundbreaking announcement of the Build Better LA initiative, a ballot initiative that will create affordable housing and good job standards for new developments in the City of Los Angeles. Over 80 community and labor leaders, as well as several television, radio, and print news outlets attended the exciting campaign launch at LA Trade Technical College in South LA. This is an historic coming together of affordable housing advocates and organized labor, forming the Build Better LA Coalition. ACT-LA staff and members, including Martha Sanchez of Alliance of Californians for Community Empowerment (ACCE), Alexandra Suh of Koreatown Immigrant Workers Alliance (KIWA), Angella Gaines of T.R.U.S.T South LA, Alan Greenlee of Southern California Association of Non-Profit Housing (SCANPH) and Laura Raymond of ACT-LA gave powerful remarks on the need to ensure that working families in LA have access to quality affordable housing and quality jobs. 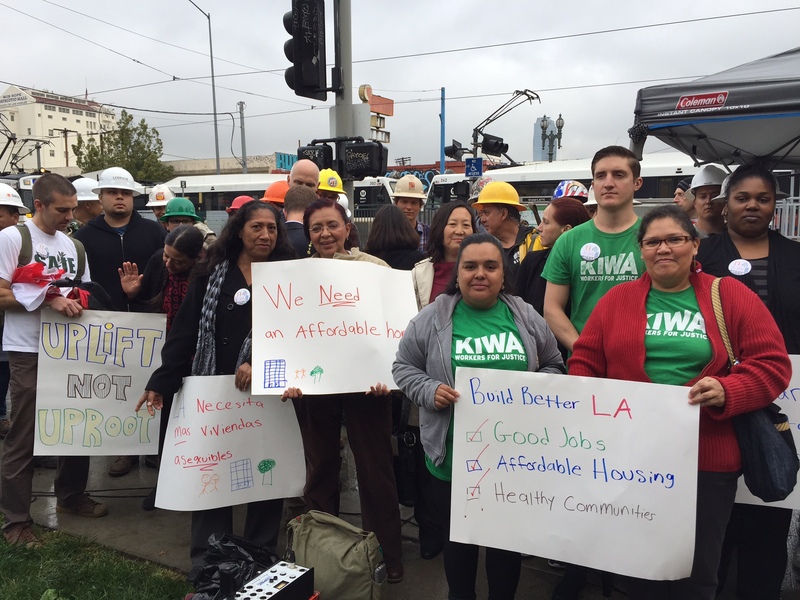 The Build Better LA initiative is bringing its jobs and housing policy to the November 2016 ballot. This policy will create transit-oriented communities incentives where developers receive density bonuses and reduced minimum parking requirements if they set-aside a percentage of units for low-income families. It also includes a local hire provision that ensures living wages and good jobs for LA residents. Additionally, it will also include a value capture measure that will require developers to set aside units for low-income tenants and provide living wage jobs when development projects are given zone changes or General Plan Amendments. The Coalition will be gathering over 60,000 signatures to qualify for the November ballot over the next several weeks. We will be joining the Build Better LA Coalition in reaching out to voters in Los Angeles from today until Election Day on November 8th and will continue organizing to make our city one where all families can thrive. For more information about Build Better LA, please contact Mariana Huerta Jones at mhuerta@allianceforcommunitytransit.org.